Cheap cruises from Long Beach are on the fun ships of Carnival, the exclusive cruise line of the popular port in southern California. We know the cruise line, but where do you want to go? Because of its location, the port at Long Beach is the gateway to such places as Catalina Island and the lovely Baja Peninsula of Mexico which has long been a glorious getaway for sun seekers and scuba enthusiasts alike. Cruises from Long Beach can take the form of short jaunts of 4 days that go to Catalina Island and Ensenada, 3 day getaways that visit the sunny Ensenada only, or longer 7 day Mexican Riviera jaunts that go to Cabo San Lucas and Puerto Vallarta. Because Catalina lies only 22 miles off the coast of California, it is a popular destination for locals and vacationers alike. A Catalina Island cruise on Carnival makes for a great last minute getaway or mini vacation where you can take in the famous Avalon Theatre, hike part of the Trans Catalina Trail, try your luck at the casinos or go whale watching. Cheap cruises from Long Beach like the 4 night sailing that leaves on May 6th, 2013 are now available starting from just $349 per person, a savings of 59%. The same cruise that leaves on May 13th, 2013 is also on sale for just $359 per person. Mexico cruises from Long Beach on the other hand are longer in duration as they travel to the tip of Baja, taking you to a mecca for scuba diving and the white sandy beaches the area is famous for. The Mexican Riviera region is made up of twenty cities and lagoons on the west coast of the country, a scenic cruise down the coast from southern California. Carnival’s cheap cruises from Long Beach to Mexico are also on sale, with their 7 night outing that stops in Cabo San Lucas and Puerto Vallarta, leaving April 7th, 2013 priced at just $639 per person. If you are willing to wait until the height of the season is over, the same cruise leaving October 6th, 2013 can be had for a 72% discount, priced at only $499 per person. 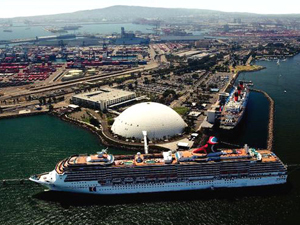 Carnival also offers tiny getaways of two nights to Ensenada and also travel to Hawaii from the port at Long Beach. Getting there is also relaxing, as the park and cruise Long Beach possibilities are plenty. Park your car and package it with a night’s stay at any number of hotels and simply hop onboard the free shuttles that take you right to the ship. Cheap cruises from Long Beach are a fun getaway to the sun and as easy to plan as they are on your pocketbook.